Electricity has become an indivisible part of our life today. We all know how much we are dependent on the electricity for almost everything. It is required for many domestic, commercial as well as industrial purposes. And the requirement is still increasing day by day. From where do we get this electric energy? There are huge electric power-generating stations called as "Power Plants". Read this article to know how electricity is generated in power plants. A power plant or generating station is an industrial location where electrical power is generated in a large scale. A power plant contains one or more electric generators - machines that convert mechanical energy into electrical. Electric generators used in power plants to produce AC electric power are popularly called as alternators. There are various types of energy sources which are used to generate electrical power. Most of the power stations use fossil fuels such as coal, oil or natural gas to generate electricity. There are others sources too, such as nuclear power, hydro power, renewable energy sources etc. The type of power plant is defined by the type of main energy source. Today, most of the electric energy is generated from the three major types of power plants - Thermal Power Plant, Nuclear Power Plant and Hydroelectric Power Plant. Since, it is not possible to elaborate on every type in a single article; these types are described briefly below. Thermal power station is the most conventional type of power plant. In these power plants, a fossil fuel such as coal is burned to produce heat. This heat is then used to boil the water and convert it into the superheated steam. The superheated steam is passed into a steam turbine. Blades of the turbine are rotated due to the pressure of the steam. The steam turbine drives an alternator which is mechanically coupled to it. When rotor of the alternator rotates, electricity is generated. These plants are sometimes called as steam power plants. Efficiency of thermal power plants is about 30%. The main disadvantage of a thermal power plant is that it pollutes the environment due to the large amount of smoke and ash. In a nuclear power plant, nuclear energy is converted into electrical energy. Nuclear energy is obtained by nuclear fission of heavy elements such as Uranium or Thorium in a special reactor. Huge amount of energy is released due to breaking of nuclei of heavy atoms into two parts. Breaking of nuclei into two parts is called as nuclear fission. Nuclear fission is a chain reaction and hence it is carried out in a special reactor to control it. Huge amount of heat energy is produced due to nuclear fission which is utilized to heat the steam at high temperature. This superheated steam is used to drive a steam turbine which is mechanically coupled to an alternator. A dam is constructed across a river in hilly area to make a huge reservoir of water. Water stored in a dam possesses potential energy. This water is then made to fall on a water turbine through penstock. The kinetic energy of falling water drives the water turbine and hence the alternator which is coupled to it. The amount of available power depends on the water head (height) and the amount of water storage. Hydroelectric power plant is one of the cleanest types of power plant as it doesn't cause any pollution. Running cost of a hydro plant is very low as compared to the above types. When electrical power is generated in a power plant, it is then stepped up to a very high voltage by using a transformer prior to the transmission. Voltage is stepped up for the purpose of reducing I2R transmission losses. 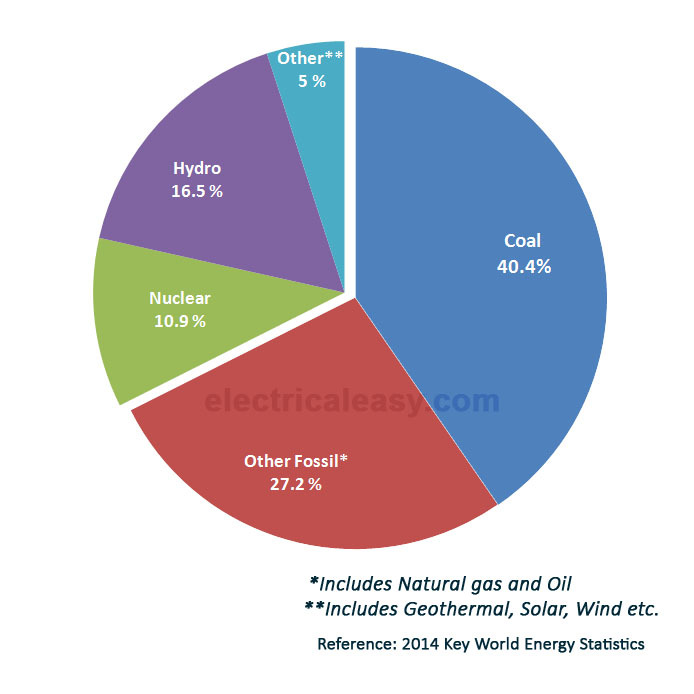 The following pie chart shows the share of different types of power plant in electricity generation of the world. It clearly shows that about two third of total electricity of the world is generated in thermal power plants. Hydro plants and Nuclear plants also play major role in electricity generation. There are many other renewable energy sources which are used for electricity generation such as Geothermal energy, Solar energy, Wind energy, Tidal energy etc. Due to some technical difficulties these energy sources are currently contributing less than 5% of the total electricity generation. Though use of these renewable energy sources is being increased day by day.